Who knew I LIKED Papaya…. Tonight I ventured out into new to me territory ~ I tried Papaya. I am not sure if I have ever tried it or not…I’ve had it in juices, but, I think that was all. I have to say it was pretty funky cutting it in half and seeing the black fish egg looking seeds inside (I should have taken a picture to share!) So, I found one online courtesy of The Daily Green to show you all. 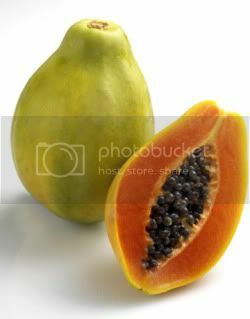 I like how sweet papaya is even if the flavor does sort of remind me like perfume. It worked perfectly in tonight salad for creating a sweet/salty/savory salad. And the Best Curry Dressing I’ve ever had. Whisked together and drizzle over your salad. I only used about 1/4 of this recipe on my salad. The book gives you two options to marinate your chicken/fish whenever you grill it. I chose the quickest one. I LOVED how tasty and light this marinade was on the chicken. I imagine you could use any combination of citrus in the recipe. 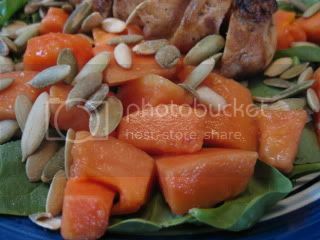 MMMMMM, papaya & pumpkin seeds! I am not a big spinach salad fan, but, this was an amazing salad. 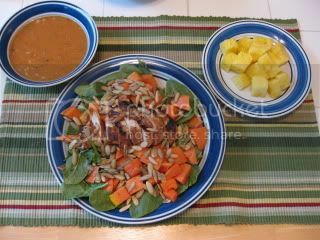 It really tasted like a fancy restaraunt salad and it was so simple to make ~ LOVED it! After I downed my salad, I moved on to the soup of the day, Roasted Tomato & White Bean Soup. Get the recipe for this soup by clicking HERE. 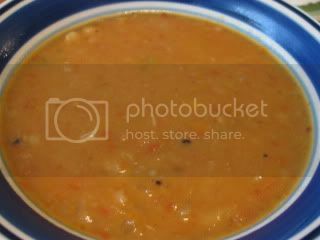 We both really liked this soup, but, I think next go round, I wouldn’t blend it all – maybe only like 1/3 of the recipe. 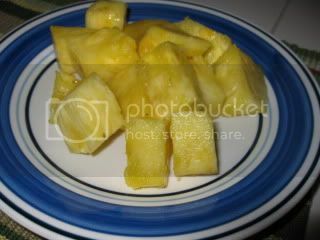 I threw dessert in with dinner tonight but actually have slowly nibbled it throughout the night….1 c of the sweetest pineapple. It was the perfect end to another successful day. All together, here is my HUGE dinner plus dessert that was completely satisfying and definitely not “diety” in any way. Ok, I promised you all GIVEAWAYS….so, get your clickers ready! * My awesome friend, Kirwin who inspires me EVERY DAY is having her very first Giveaway ~ it’s the coolest book about your Style Statement. Click HERE to enter her contest and be sure to check out her blog ~ she is an awesome writer too! * Sarah is celebrating her 200th post and giving away magazines ~ Am I the only one with a magazine addiction?! Probably not, so click HERE to check it out. * Megan is celebrating her 100th post with a mini bar giveaway ~ click HERE. * Organic VEGAN Sunshine Burgers Coupon Giveaway – Click HERE. Don’t forget, you can also snag your copy of the Bikini Bootcamp Challenge by joining us this month. Send an email to sign up and you will be entered to WIN. Click HERE to learn all about it. Coming up next….I know, I made you all wait ALL day….My Mr. Krispers Giveaway & Review #1! Your salad looks soo good!! I'm not a huge fan of papaya though :/ thanks for the shoutout about my giveaway!! I'm glad to her you're putting the soup recipe up because it sounds delicious!! That salad looks amazing! I love fresh papaya! hey did you know that june is national papaya month?! how fitting! 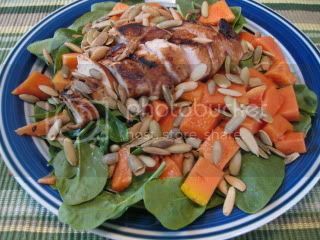 that is such a neat twist on the spinach salad. the dressing recipe is note worthy, i think i have all the ingredients for that! 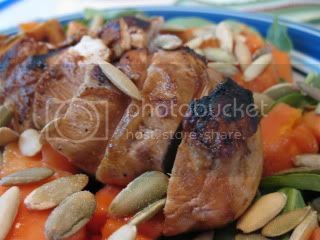 Anne ~ You could definitely use the entire recipe using fish – just use the marinade and it's all the same. I bet even shrimp would be good if you eat that. health ~ It really was a delicious salad…It is a definite keeper in my book. I never thought I'd like papaya but it worked well in this recipe. Healthy on the run ~ you could always use mango or cantaloupe in the recipe with awesome results too. K – I promise soup recipes coming soon – I just need to find some time to type them up. Janetha ~ I wish I knew that – I would've included it in my post 😀 Thanks for the heads up though…I do think you will love the dressing.